Search for all "Insulin-like growth factor I / IGF1"
Insulin-like growth factor I / IGF1. 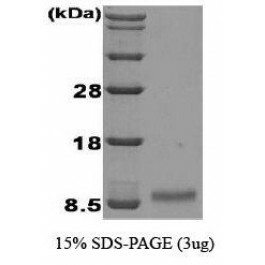 Product is tested for Enzyme Immunoassay, SDS-PAGE. The Insulin-like growth factor-1(IGF-1) is mitogenic polypeptide growth factors that stimulate the proliferation and survival of various cell types including muscle, bone, and cartilage tissue in vitro. IGF-1 is predominantly produced by the liver, although a variety of tissues produce the IGFs at distinctive times. The IGF-1 belongs to the insulin gene family, which also contains insulin and relaxin. The IGF-1 is similar by structure and function to insulin, but have a much higher growth-promoting activity than insulin. 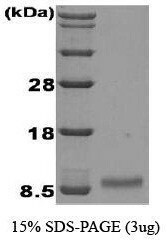 This recombinant human IGF-I is globular protein containing 70 amino acids, and 3 intra-molecular disulfide bonds. Recombinant IGF-1 was expressed in E.coli and purified by conventional chromatography, after refolding of the isolated inclusion bodies in a renaturation buffer.